Part 2 of Workbot for Slack + Product Hunt, Read Part 1 for makers here. When Product Hunt announced that they would be having a Hackathon, our team decided to optimize Workbot for Slack’s abilities for Product Hunters specifically. Workbot is a bot for Slack (or Hipchat) that you can command to perform business processes using your cloud apps like Salesforce, MailChimp, Zendesk, Eventbrite, Jira and more directly from your chatbox. 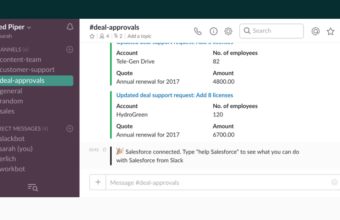 You can get smart notifications from Zendesk, access customer information from Salesforce, create new tickets in your apps and more without ever logging into the app or leaving Slack’s chatbox. You can receive a list of the top 9 posts on Product Hunt with votes above 200 right in Slack by saying, “@workbot producthunt list posts vote:200.” You can change the vote count by changing the command to “vote:100” or whatever threshold you want to set. “Vote:100” will show you the most recent 9 products with over 100 votes. You can follow hunts of your choice and get summary notifications of voting trends and engagement for that specific hunt as the day progresses. Workbot will notify you of the post’s votes every hour and the number of comments. You can also get these trend counts for past hunts on Workbot. Use the Command: @workbot producthunt list posts and you’ll see a list of the most recently added products inside Slack. If you use the command Command: @workbot top posts in producthunt for cat:tech top:5, you can see the top posts from a specific category. Place the category such as tech, games, books, podcasts after cat: and the number of results you want after top:. In two quick steps, you can start using Workbot with Product Hunt and over 100 other apps! Type “Help” to see the list of commands and get going!